Be the first to share your favorite memory, photo or story of Alverta "Vert". This memorial page is dedicated for family, friends and future generations to celebrate the life of their loved one. 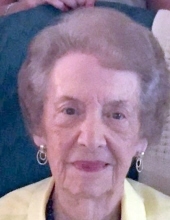 Alverta “Vert” Fulton Watson, 97, widow of Henry Devon Watson, died Saturday, September 15, 2018, at her residence. Mrs. Watson was born in Andrews on August 20, 1921, a daughter of the late James Alva Fulton and Bernice Ida Ivey Fulton. She graduated from Andrews High School and Columbia Business College. Mrs. Watson worked for Brooks Veneer for many years. Later she was the Secretary for Williamsburg High School, where she was an advisor for the annual staff and was loved by the students. She felt that her main job was keeping her sisters in line and considered her nieces and nephews as her own children. Mrs. Watson was an avid gardener and even mowed her lawn until just a couple of years ago. She was one of the oldest member of Trinity United Methodist Church. In addition to her parents and husband, Mrs. Watson was predeceased by: four sisters, Inez F. Altman, Juanita F. Strong, Lucille F. Hail, and Betty F. Cox. Surviving are: two sisters, Nell F. Easler of Greeleyville and Emily F. Knobeloch (John B.) of Orangeburg; and a number of devoted nieces and nephews. Funeral services will be two o’clock Wednesday afternoon, September 19, 2018, in Trinity United Methodist Church. Officiating will the Rev. Dr. Ben Gafford. Burial will follow in Andrews Memorial Cemetery. The family will receive friends prior to the service on Wednesday from one until two o’clock in the church Sanctuary. Memorials may be made to: Trinity United Methodist Church, 205 S. Rosemary Ave., Andrews, SC 29510 or Tidelands Community Hospice, Inc., 2591 N. Fraser St., Georgetown, SC 29440. To send flowers or a remembrance gift to the family of Alverta "Vert" Fulton Watson, please visit our Tribute Store. "Email Address" would like to share the life celebration of Alverta "Vert" Fulton Watson. Click on the "link" to go to share a favorite memory or leave a condolence message for the family.